Any package created with Launcher can be edited and customized using the program LaunchBuilder. From an open package, select the File | Edit menu item. This command will open the package in the program LaunchBuilder and allow for editing of the materials. By using the program LaunchBuilder, we have made it easy for end users to author and distribute their own Launcher-based curricular material without recompiling Java code or creating jar files. Launcher-based curricular material is organized using an xml configuration file referred to as a TabSet and having an XSET extension. The save dialog allows authors to save all the Tab files defined in the current TabSet as individual xml files or to combine multiple xml files into a single self-contained xml file by collapsing a tree node. In other words, independent nodes are identified in LaunchBuilder by a file icon. If the top-level TabSet node is collapsed by clicking, then all xml data will be saved in a single XSET file and the XML file names are not saved. Programs within the package can be initialized by reading an appropriate xml data file via the args text field in the Launch tab. This allows authors to have the program show a pre-defined set of parameters and also a simplified user interface without parameters. 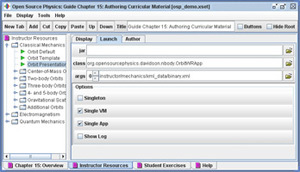 A curriculum author (or advanced user) can edit the modelâ€™s parameters and save them in an xml data file. Once changes have been made to the package, LaunchBuilder allows the author to repackage all of the additional resources in a new package via the File | Create Jar menu item.